Conqueror has been designed to suit a wide cable range take, allowing one cleat to fit a much broader range of cable sizes than a conventional fixed hinge cable cleat. A common problem when ordering cable is that the actual outer cable diameter may vary from the nominal size by as much as 5%. If the cable diameter is at the upper or lower limit of a fixed hinge cable cleats range, this could result in the cleat being either too small or too large to properly restrain the cables. When this happens during a project, especially one situated in a remote location, there will be delays and additional costs to re-order cleats of the correct size. The Conqueror can easily cope with these size fluctuations, reducing the need for multiple cleat sizes to safely clamp the cables. The simple and easy-to-use adjustable hinge of the conqueror cable cleat allows each of the 16 sizes to provide a cable range take of 9mm, almost twice that of other fixed hinge cable cleats. and tested for exceptionally high short circuit conditions on cables held in trefoil application / formation, to ensure the securing and retention of cables without damage. Conqueror is unique with its patent pending adjustable hinge. The movement of this hinge virtually doubles the range take adjustment when compared to other fixed hinged products on the market. 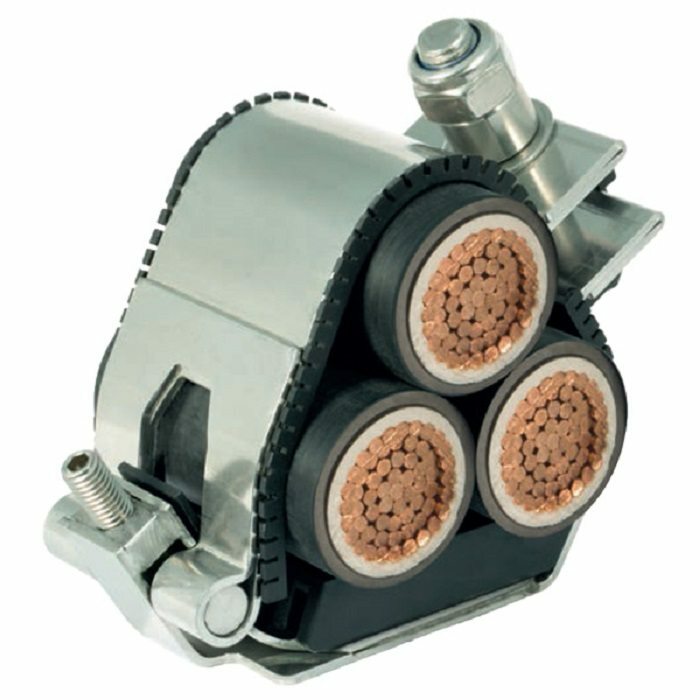 Conqueror covers a range of cable diameters from 19mm up to 130mm in only 15 sizes. The cable cleat is fabricated from 316L stainless steel, giving it high creep strength whilst providing excellent corrosion resistance in the harshest of environments. The Conqueror cable cleat has one M12 and two M10 fixing clearance holes within its base, allowing versatility to the installer during installation, and is designed to enable the product to be secured to a variety of mounting surfaces. 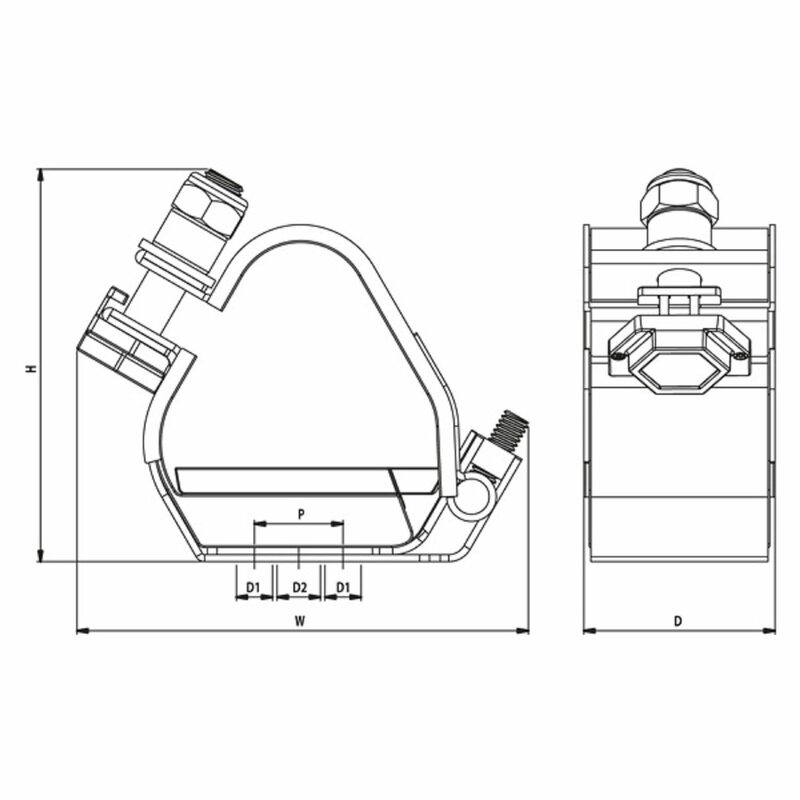 The cable cleat hinge opens fully, allowing the cables to be easily placed within the cable cleat, to aid the installer before closing and securing via the mouth piece bolt. liners supplied are classified as Low Smoke & Fume (LSF), Zero Halogen (LS0H) and Phosphorus Free. Coatings are available upon request by adding the following suffixes to the ordering reference – EC for epoxy coating, PC for polyester coating and TC for thermoplastic coating. Example order reference for epoxy coating suffix EC (RTSS065074EC). Fasteners required to secure the cable cleat to the support structure are not included but can be supplied upon request. Isolation/separation pads (to prevent corrosion between two dissimilar metals) are not included but can be supplied on request - see isolation / seperation page.